A mostly instrumental recording with wordless vocals from all four Beatles, Flying was recorded as incidental music for the Magical Mystery Tour film. Originally titled Aerial Tour Instrumental, it was the first Beatles recording to have a songwriting credit featuring all four members. Flying was the only Beatles instrumental released by EMI. The group had previously recorded Cry For A Shadow in Hamburg in 1961, and 12-Bar Original during the Rubber Soul sessions in 1965. In the Magical Mystery Tour film, Flying was used to accompany landscape scenes of Iceland taken from an aeroplane. These sequences were unused outtakes from Stanley Kubrick's 1964 film Dr Strangelove. 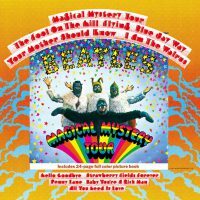 Flying was an instrumental that we needed for Magical Mystery Tour so in the studio one night I suggested to the guys that we made something up. I said, 'We can keep it very very simple, we can make it a twelve-bar blues. We need a little bit of a theme and a little bit of a backing.' I wrote the melody. The only thing to warrant it as a song is basically the melody, otherwise it's just a nice twelve-bar backing thing. It's played on the Mellotron, on a trombone setting. It's credited to all four, which is how you would credit a non-song. On 8 September 1967 The Beatles recorded six takes of the song. It underwent various changes during the session, and a saxophone jazz solo was used during the lengthy coda, sampled from an unidentified modern jazz recording. Take six featured drums, organ and guitar. Three organs, recorded then played backwards over the basic rhythm track, were then added, and John Lennon recorded the main melody on a Mellotron. Following this, all four Beatles taped their chanted vocals. On 28 September Flying was completed, with the addition of more Mellotron from Lennon (the mellifluous melodies most noticeable at the end of the track), guitar by Harrison, and various percussion instruments played by Starr. Lennon and Starr then compiled a series of tape loops, effects and backwards recordings. At this point the tune was 9:36 long, so it was edited down to the more manageable form in which it appeared on the Magical Mystery Tour EP. The “jazz” sample was from a setting on the Mellotron, not from a recording. …brilliantly covered by The Residents. Yeah, that “The Residents Play The Beatles/The Beatles Play The Residents” EP is brilliant in every way! John: main organ, three backward organs, two mellotrons, vocals, sound effects and tapes loops. Paul: guitar, bass and vocals. Ringo: drums, percussion, vocals, sound effects and tape loops. I think most of the articles feature the personnel as presented by Ian McDonald. It would be better if every article is redoing according to Lewishon. I disagree on the last point. A lot of Lewisohn’s 1980s research has since been improved upon. Most of the articles do take their cue from Macdonald’s book, but with amendments when they come to light. Lewisohn research has been improved, but still it seems more accurate than McDonald. Macdonald’s line-ups aren’t perfect, and I don’t use them exclusively. He did, however, correspond with Mark Lewisohn while writing Revolution In The Head, so I think the latter is probably more accurate. Also, Macdonald had a greater understanding of musicology than Lewisohn, so is more likely to have been able to pick out performances as being by particular band members. I try and draw on various sources, including Mark Lewisohn, Ian Macdonald and Walter Everett, and compile an accurate line-up based on their findings. I think it’s a far better method than sticking to one source from the 1980s. As it happens, I think Everett’s books are far more accurate than either of the others’. 9:36 of ‘Flying’? I would love to hear it! Here it is for you, Joe. Yeah, I wish it was longer. I always liked this trippy little track. I wondered how it was written – jointly by the band. Did they have a deliberate plan to do a primarily instrumental track, or did it just develop out of a jam session? Also, I wondered if Flying is considered by the band as Ringo’s vocal contribution to the MMT project, or did they feel Ringo didn’t need a song on this one? Considering that John only had one song on MMT, I guess Ringo didn’t merit one of his own (with only 6 new songs in the entire project). ‘Magical Mystery’ isn’t really an album. It’s a compilation. An EP combined with some singles. It’s now considered an album, but not at the time. Feels like a tribute to Joe Meek to me. What a great track this is. The bootleg 9 minute version is incredibly eerie, about as trippy and psychedelic as it gets. hard to believe but i heard this song for the first time a few weeks ago. cannot get it out of my mind. such a beautiful thing knowing they did it so long ago. The footage used in MMT is from “Dr Strangelove” and not 2001. Kubrick filmed MILES of footage in the Arctic, most went unused. The proviso was that the Beatles could use as much as they wanted from Strangelove , as long as no frames were duplicated in MMT. According to McCartney, “Flying” was his song. Well, he wrote the basic melody. I’m curious what the contributions of Lennon, Harrison & Starkey were to the song. Well, Lennon played the Mellotron, so it must have been his melody. Well, not necessarily! I can imagine John just wanting to play something on the Mellotron. He was keen on varied keyboard sounds in the Pepper/MMT/White Album period and played quite a range of them. The first time I heard this was on a weird advert that commercial TV used, as a filler between shows, of shiny new Harrier Jump Jets. That would be interesting to see again. It was actually a publicity advert for the Air Training Corps, which also showed the air cadets flying in training gliders. Listening to the entire 9:36 of Flying made me so grateful that someone decided that was too long – ugh! There is something noticeable for “Flying”! The Fabs must have taken the original idea (or Paul or John…), for more development, from the instrumental b-side of the 1960’s Chuck Berry’s single “I Got To Find My Baby”/”Mad Lad”! The similarities between “Flying” and “Mad Lad”, on the rhythm, on the time signature and on the beats on the compasses, are, from my humble point of view, evident! Best regards to all of you Beatle people! And Joe, as I said it before here somewhere sometime, you’re the man! Great, great, great job on writing, researching and compilation! I wish MMT would be considered as the original EP here (and everywhere in this Forum for that fact), and not the Capitol LP. We are talking about a historical EP & Movie, nothing to do with North America & Capitol Records. Let’s get some love for George’s glorious, slippery, silky guitar work. Not flashy, just subtle-ly seductive in melody and timbre. Well, the guitar playing has “love” from me — very slinky and languid! I’d, however, be absolutely astonished if it were played on either a Strat or an acoustic guitar. I’d love to know how the main guitar track’s tone was accomplished. Definitely sounds like a Strat but played through what… effects, amp, pedals, the board? Love this cut so much. There are 3 guitars, George’s rhythm guitar is played on a Fender Stratocaster with the built in tremolo effect from his Vox amp, Paul’s Epiphone Casino and George’s amplified Gibson J-160E are played clean.